Ummm....why do you need a permit from the Department Transportation?? Seems weird that the Dept. of Transportation has to be involved to build one little house, doesn't it? I mean, it's not like we need them to put in a new road or anything! But apparently everyone has to get a permit just to put in a new driveway. Wait... how much did you have to give them?!?! Even more surprising than VDOT being involved in the first place was that we needed to put up bond money to promise we wouldn't screw up the road. And it's serious money too - $20K!! (Usually it's $10K for a driveway, but we had to put up another $10K because there's a ditch by the side of the road and we need to install a culvert pipe under the driveway). We don't exactly have a spare $20K lying around (especially after our down payment! ), so we just paid a $200 fee to a bond company to handle it - it sounds like most people go with that option. Sidenote - we also had to do something similar for a 'Conservation Agreement'. For that one, we just had to put up $2K that we get back based on the accurate completion of the grading plan. And we had to do a 'Pro Rata Share Agreement' for the water drainoff from our property - that one's not refundable sadly but was less than $500 at least. So many random pieces to this process! But how complicated was it? Like everything else, getting this permit has been slower and more complicated than we expected! It took about three weeks to hear back from VDOT, and then of course, there was an issue. 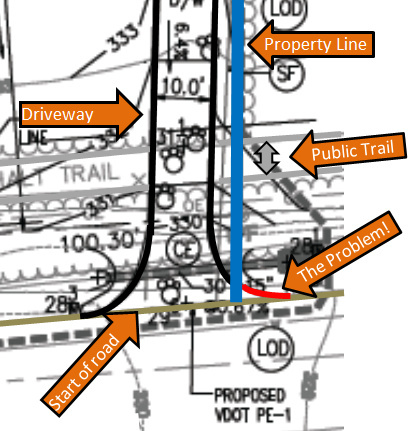 Apparently the way the driveway was drawn on our plans it crossed the property line, so it sweeps out at the end onto the adjacent property (not sure how no one noticed/mentioned that earlier...). The picture shows the problem - just a small portion of driveway is shown; the house is way back from there. We had to get a signed & notarized 'letter of no objection' from the owner of the lot next door. He's been great - he's the guy we bought our land from and who owns the still vacant lot next to it. We've had to keep bugging him over and over again, and we are so thankful he's been so easy to work with! We actually just met up with him today to get this letter taken care of, and just a few hours later VDOT issued the permit - so luckily things went very quickly & smoothly after the initial wait. So what's next? Can you start building? Nope, still not yet! 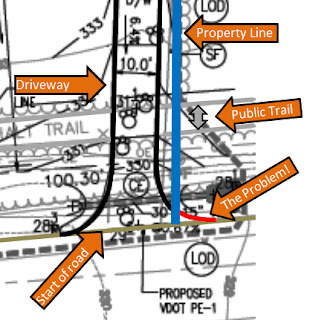 Now that the VDOT permit was issued, the builder can finally pick up our approved plans from the county. Then they need to be submitted to the Zoning Department. We're also waiting on the Building Plan Review (apparently our drawings had a few comments that are currently being addressed). After those two approvals (which we expect to take a couple of weeks), then we can finally get our building permit. So still a few more steps, but we're getting there!